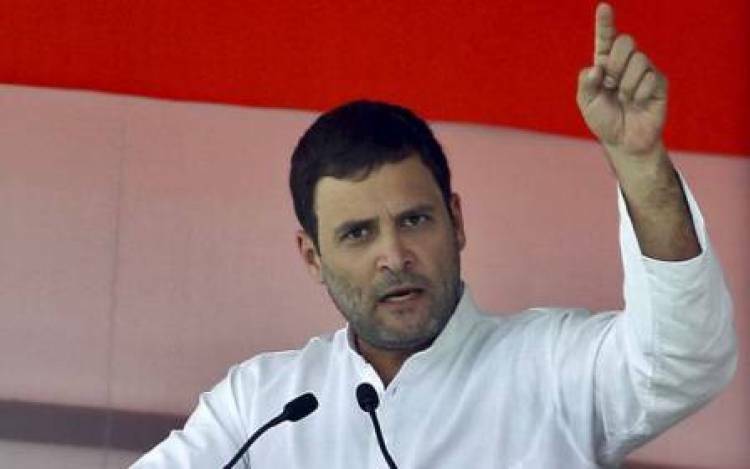 UDAIPUR: Congress President Rahul Gandhi launched a blistering attack on Prime Minister Narendra Modi saying he exploited the surgical strikes of 2016 to prevent defeat in the Uttar Pradesh Assembly polls last year and claimed that the UPA government did three similar strikes but kept them a secret. He also accused Modi of claiming to be the repository of all wisdom and interfered in the "domain" of others whether it was demonetisation, foreign or agriculture ministry or the surgical strikes. Responding to a question during an interaction with the business community and professions, Gandhi said Modi was fighting a losing political battle in Uttar pradesh in 2016 and turned the surgical strikes into a political asset. "He was fighting an election in UP. He was fighting a losing election. He turned a military asset (surgical strikes) into a political asset. He reached into army's domain told them I don't care what you think. I am going to make it public. "Narendra Modi actually reached into army domain and shaped their surgical strikes. He turned their surgical strike into a political assest when it was a military decision," he said. Gandhi said the Congress governments were very clear about military responsibility and military domain. "We listen to the army. If army says that this is what we want to do, we say, yes sir, its your job, please do it. Political domain, if they (army) come and say, we say sorry. You have no business. Please stay out. "When army came to Manmohan Singh ji and said we want to retaliate, he (Singh) said we need to keep it a secret for our own purposes," he said adding that there were three strikes during the UPA regime and they were kept a secret as a military asset. Rahul Gandhi's remarks came in response to a question on the alleged attack on institutions like the Supreme Court, CBI, RBI, the CVC by the Modi government and the way people from the army were entering politics. "The Prime Minister reaches into the military domain, tells them what to do, forces them to do something and then obviously he required V.K. Singh" (former army chief). Hitting out at Modi he said that this was the confusion in the Prime Minister's mind as he was convinced that he knew better than the army what should be done in their area. "He knows better than the Foreign Minister with regards to what needs to be done in foreign ministry. He knows better than Agriculture Minister about what needs to be done in agriculture ministry because he has a sense that all knowledge flows from his brain. "Because Modi believes that the entire knowledge is with him and others know nothing. That is why he announced demonetisation. He locked up the Cabinet before the announcement. Jaitley (Finance Minister Arun Jaitley) did not know it. And you (Modi) destroyed the major economy of the world. Because you (Modi) believe that you know everything," he said. Gandhi said that former Prime Minister Manmohan Singh had utmost respect for his Cabinet, for his ministers and even for Advani ji. "The second phone call that went from Manmohan Singh's office was to Advani after the 26/11 Mumbai terror attacks because the Prime Minister felt that he needs to tell him (Advani) what is going on, because he represented opposition," he said. "But Modi has never called me. He never called Manmohan Singh ji. Not even Advani ji," he added.